1. How can I add/manage my contact sources (address books) like Google, iCloud, Exchange, etc.? 2. Where can I disconnect an address book? 3. How many contacts can I store in my FullContact account? 4. Where can I find a backup file of my contacts? 5. What happens if I turn syncing on for my Google Contacts, iCloud, and/or Exchange address book? 6. What is the difference between ‘Update Existing’ and ‘Add as New’ in my FullContact account? 7. How do I force a sync within FullContact? How can I add/manage my contact sources (address books) like Google, iCloud, Exchange, etc.? 1. Use the blue [+] icon at the top of your Web app account and click Source. 2. Add sources on your Settings page. Keep in mind that you can view all of your sources (individually or collectively) in the Tags dashboard; scroll down to Sources then click on your connected email address books, imported files, etc. 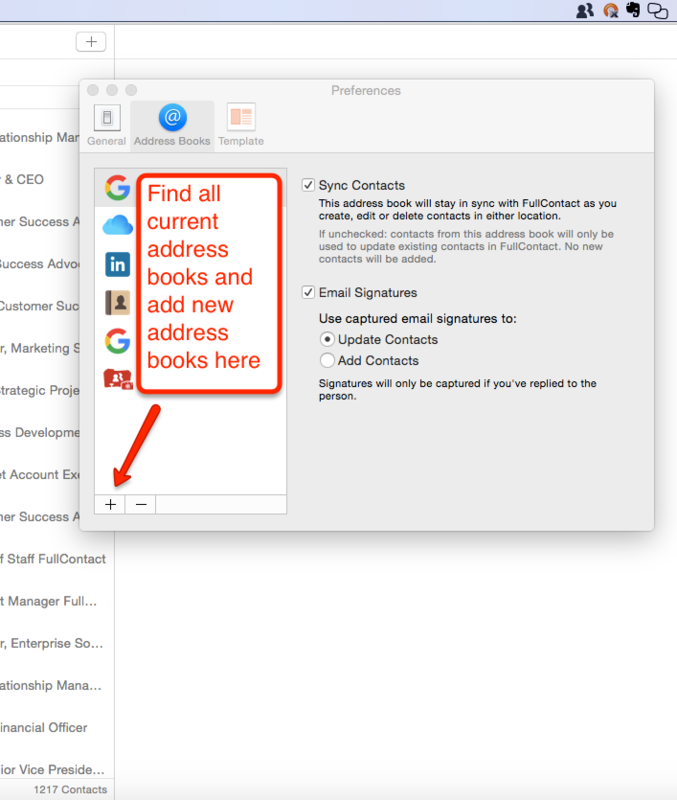 In FullContact for iOS, click on Settings -> scroll down to Address Books (manage your connected address books) -> click Add Address Book (to add a new source). In FullContact for Mac, click FullContact (menu dashboard) -> Preferences. Where can I disconnect an address book? You can disconnect an address book in the same location where you can add an address book. In FullContact for Web, specifically, you'll do this on your Settings page. How many contacts can I store in my FullContact account? With a Basic (free) FullContact account, you can store up to 1,000 contacts. With a Premium (paying) FullContact account, you can store up to 25k contacts (this includes your quantity of transcribed business cards contacts set to enrich your My Contacts list). Where can I find a backup file of my contacts? This direct link in the Web app; otherwise, click on your profile photo in the upper-right-hand corner -> click Settings -> click Backups on the left-hand-side. What happens if I turn syncing on for my Google Contacts, iCloud, and/or Exchange address book? 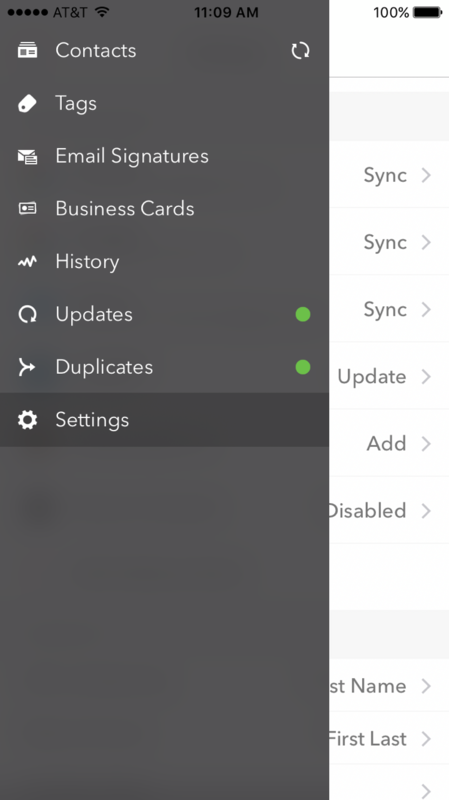 If you turn syncing on for any of your connected email sources, you will be adding the contacts in that email source to your My Contacts. If you turn syncing on for multiple connected email accounts, all email sources will have the same contacts. 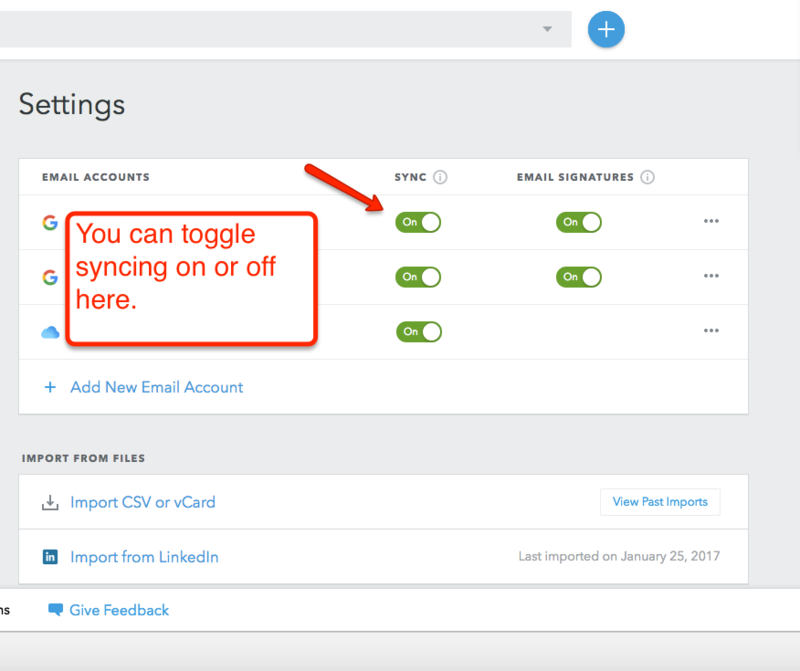 However, you can opt to keep the syncing turned off for an email account. If you choose to turn it off, the contacts in that email source will not be added (as new contacts) to your My Contacts. Rather, you can manually add contacts from that source to your My Contacts later. 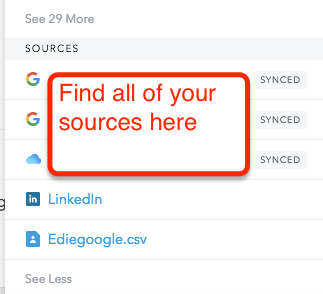 To view all contacts in a source that you have opted to keep the syncing off for, click Tags (home page of your Web app) -> scroll down to Sources -> click on the source. What is the difference between ‘Update Existing’ and ‘Add as New’ in my FullContact account? These are your sync settings. When importing a file, you choose Update Existing or Add as New. If you choose Update Existing, we will only update your existing contacts in your My Contacts (no new contacts will be added). However, if your choose Add as New, we will add all contacts from your imported source to your My Contacts; simultaneously, we will update any of your existing contacts where it's necessary. How do I force a sync within FullContact? In FullContact for Mac, click File -> Sync Now. In FullContact for iOS, click Contacts at the top of the home page (revolving arrows). In FullContact for Android, click the gear icon (bottom-right corner) -> click Sync.